Here is the next of the questions we were most asked when were last in the US. Most of the languages of the world which do not have a translation of the Bible, have never been written. So they do not have an alphabet. One of the first tasks is to develop an alphabet for the language. But languages are written with many different kinds of alphabets. To the right you can see just three including the Latin alphabet used to write English. A kind of alphabet is called a script. So, which script do we use? That depends. Usually it depends on the more prestigious languages found in the same place. People speaking a minority language in Thailand, for example, will usually want their language written in Thai Script. For one thing, that makes it easier from them to learn and read the official language – Thai. Dayle and I have worked in former British and French colonies in Africa where the official language is English or French. So languages in those countries are written with a script that is like English or French. But the languages have sounds not found in English or French, so some letters are added. Here is a typical example from the Nafaanra languages of Ghana. The text is from Isaiah chapter 1. The people who speak the language and the relevant local authorities make the decision about how to write it. It is their language after all. What is easiest and seems best to them is more important than what a missionary may think, want or find easiest. If these scripts look impossible to you, remember that for the people who use them from their childhood they look easy and natural and our alphabet looks complex and strange. Remember, the Bible was first written in two different scripts: the Old Testament in Hebrew script and the New in Greek script neither of which is the script we use for English. Occasionally the choice of a script can be controversial. 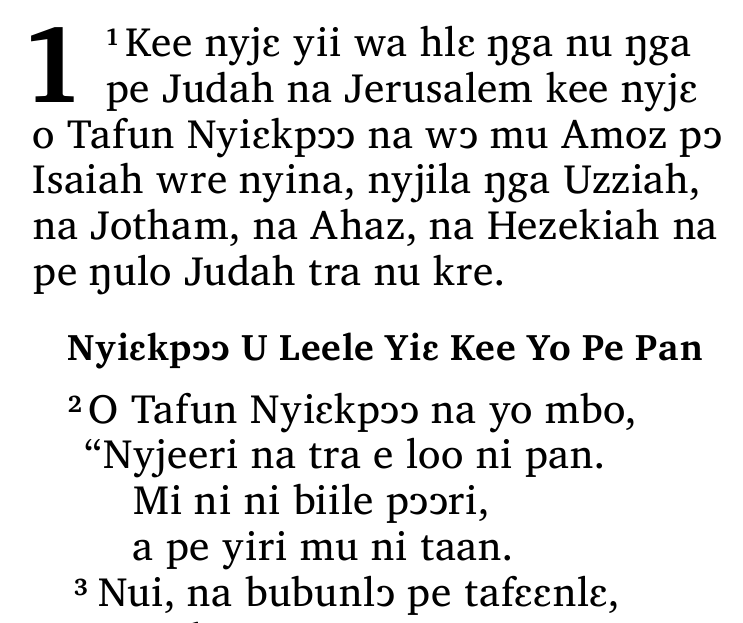 I have seen cases where the same language is written with two different scripts. Some write it with one and some with the other. In such cases, many people learn to read both. 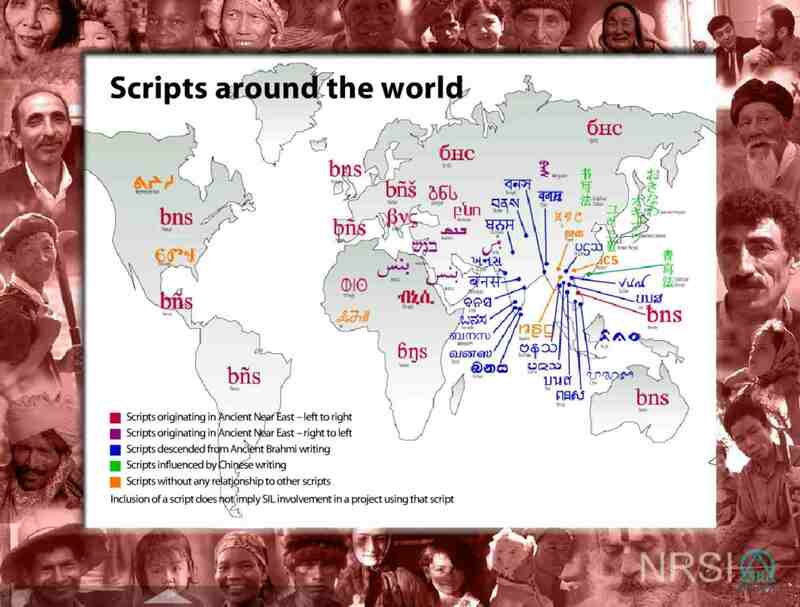 There are dozens of scripts around the world, some are very complex. In fact, they are so complex that special computer programs had to be written before they could be displayed or edited on a computer. That work was often done by missionaries. I’ll write about that in a future blog. Here is a map of some of the world’s major scripts. Click to enlarge it. This entry was posted in Bible translation, Language, Linguistics, Literacy and tagged alphabets, script, scripts, writing systems. Bookmark the permalink. Pingback: Wycliffe UK blog » Blog Archive » What alphabet do you use? Thanks for sharing. My son is a graphics design major and has had to design new fonts. I forwarded this to him, and think he’ll identity with and appreciate the labor involved in this.